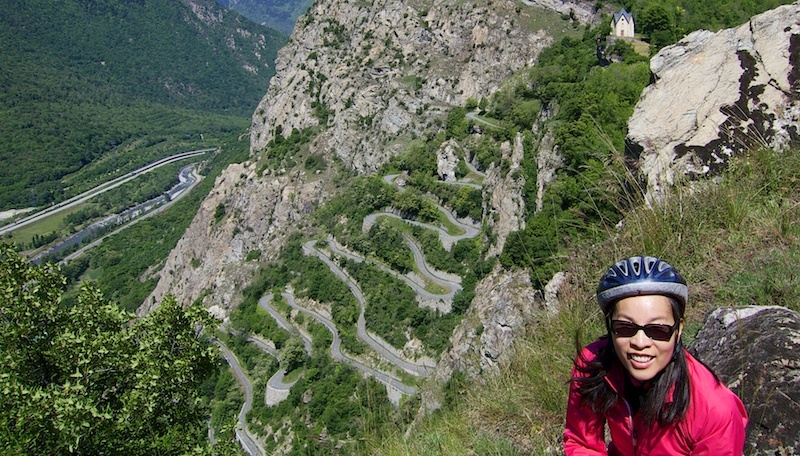 On a beautiful Sunday morning, Doreen said she wanted to cycle something “special.” So we headed a little south and I introduced her to the fabulous Lacets (hairpins) de Montvernier. 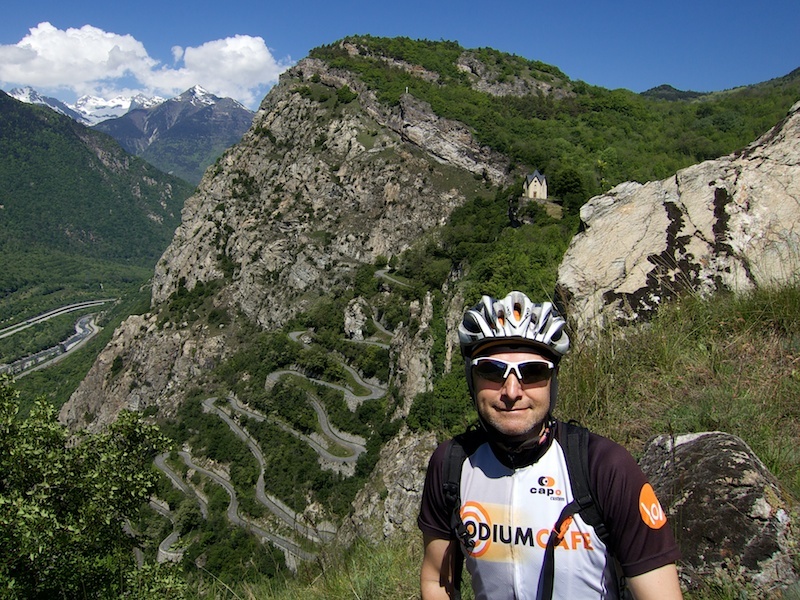 Dating from 1934, this fun little road features 18 hairpins in quick succession to climb up to Montvernier. It is impossible to photograph all the hairpins while cycling it. But it is a blast to ride. But a few years back I found a trail (see map below) across a field to a cliff look out that scares the hell out of me. But one can see the entire road. Doreen took this photo while I pretended not to be scared. 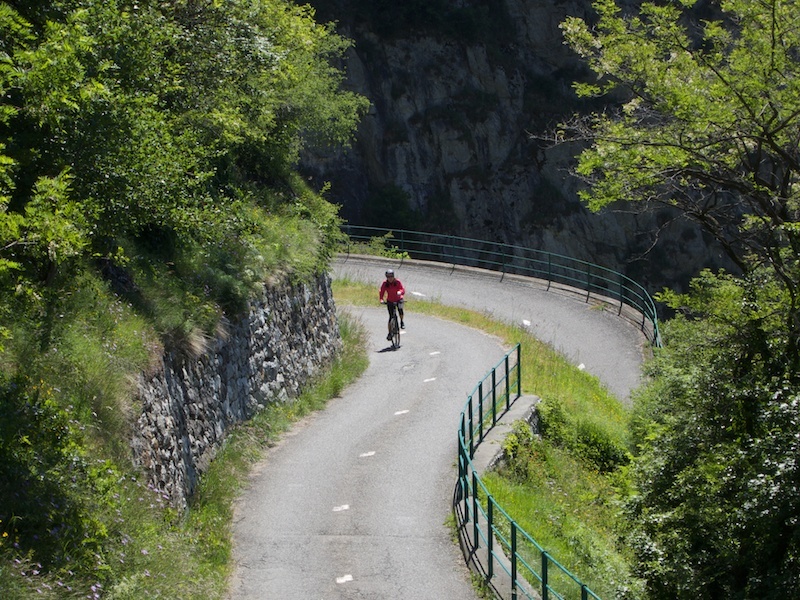 It’s less than 3 kilometres up Les Lacets to Montvernier, so it doesn’t take long. 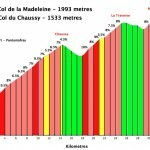 I had to explain to my brave wife that we were going to keep going higher up to Col du Chaussy. 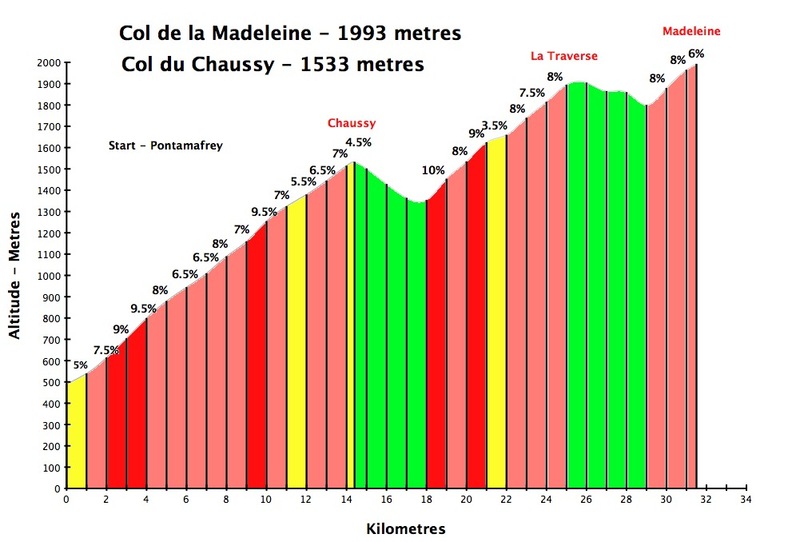 Chaussy is a pretty big climb with more than 1000 metres of elevation gain. From Montvernier if you look up you can just make out the road carved into the cliff high above. Fun. Note, from Col du Chaussy one can descend the other side briefly, then take an unbelievable unpaved route to Col de la Madeleine. See here for details. The profile above includes this road. After the Cliff stretch there is a still more work to do. The last couple of kilometres climb up an alpine meadow to the sounds of hundreds of baaaahing sheep. But the views are terrific. Happiness is a Col sign photo with my favourite person. Note, we descended a slightly different road from Montvernier. Very scenic, it crosses Col du Ventour and passes a nice old castle ruin. Some of the most beautiful hairpins anywhere, a great cliff road, and my brave wife. A winning combination. Thanks for the great article. I’ve looked up at that cliff a few times while driving northbound from St Jean de Maurienne and always wondered if it’s an accessible road or not. 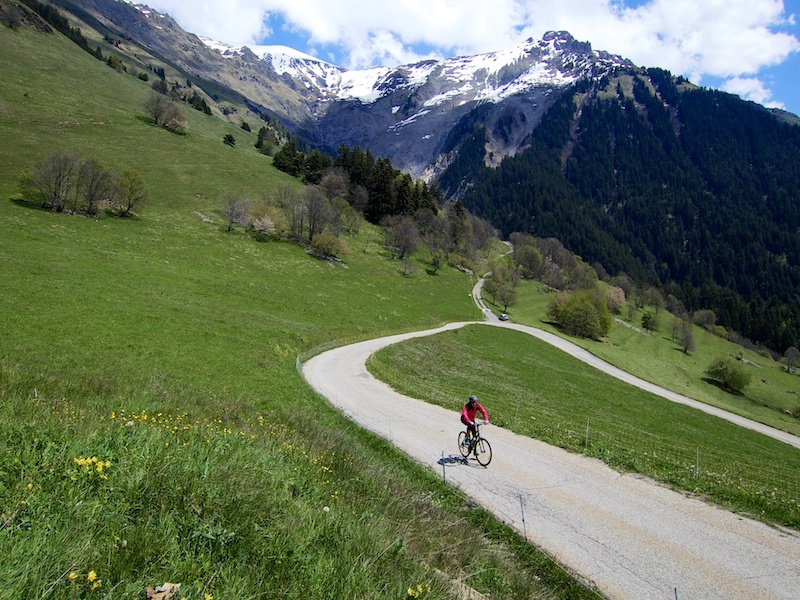 So I’ll definitely try it next time I’m down that way, although it’s usually because I’ve driven down to Maurienne to park the car and ride the Galibier/Croix de Fer loop, after which I’m quite fed up with climbing ! But my desire to check out amazing hairpins must be fulfilled ! I did this on the Friday just gone and you never cease to please me. An amazing ride. Caution at the beginning as you get a bit excited riding the Lacets and I must admit it took the breath out of me for the next couple of km’s. Still, all worth it. As you said the ride isn’t an easy one and my wife was going to meet me at the top, but got scared off by the tight road and overhang. This road isn’t for the faint hearted. Ha, yes, it’s a huge ride and les lacets are only a tiny, if fun, portion of of it.